The City is holding a Community Consultation drop-in event where you can learn more about this study, ask questions and share your comments. Built around 1960, the Black Creek Sanitary Trunk System (STS) is a 15 km long sanitary trunk sewer that services the 5,500 hectare drainage area. The trunk system ultimately flows to the Humber Wastewater Treatment Plant. During major storms, flows in the trunk system exceed the design capacity. This has caused overloading and surcharging. Also, during some storms, overflows area released from the combined trunk sewers to the Black Creek watercourse, which need to be controlled according to Ministry of Environment, Conservation and Parks’ criteria. Over the next few decades, a population and employment increase is expected within the study area, which will need to be accommodated by the trunk system. Three rounds of Public Information Centres (PICs) will occur for this Class EA Study project. The first set of PICs took place in April 2016. The second PIC is on April 4, 2019 at Falstaff Community Centre from 6:00 p to 8 pm. The third PIC will take place in spring and late 2019/early 2020. Notification of the PICs will be advertised in the local community newspaper and notices to be mailed to residents within the study area. 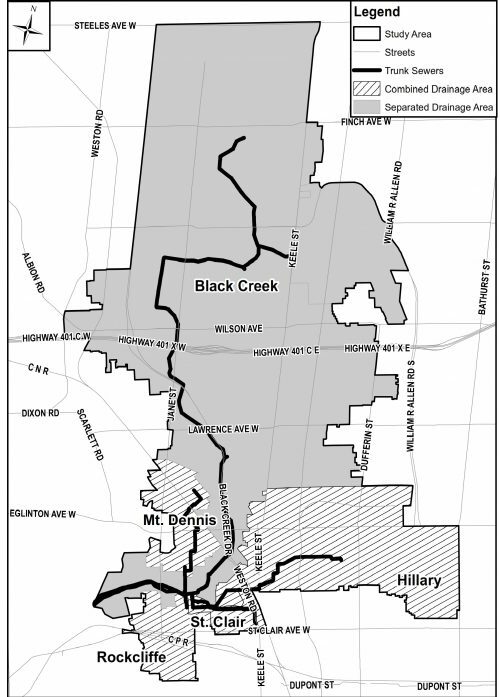 In 2015, the City of Toronto has initiated a Municipal Class Environmental Assessment (EA) study to address problems and opportunities with the Black Creek Sanitary Trunk Sewer (STS) within study area. The study is being planned as a Schedule “C” project under the Municipal Class Environmental Assessment document. The Class EA process provides members of the public and interested parties with opportunities to provide input at key stages of the study. The studies will define the problem and the causes of the problem, consider and evaluate alternative solutions, assess impacts of the preferred solutions, and identify measures to lessen any adverse impacts.